How do I change my shipping or delivery address for my order? 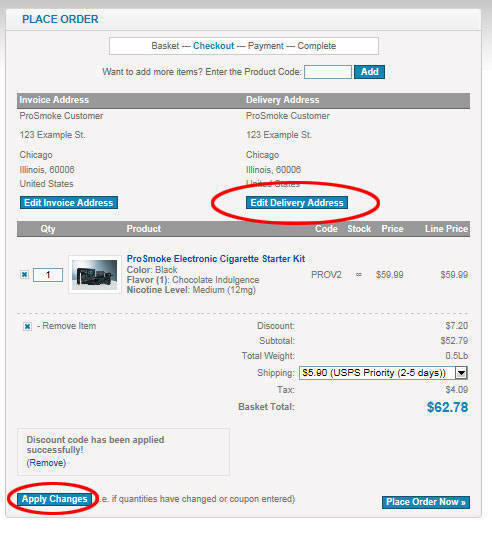 To change the address you want your e-cigarette kit or components delivered to, you can change the details directly in the shopping cart. Once logged in and viewing your cart, you will see two addresses listed, a BILLING and DELIVERY. Simply click the EDIT DELIVERY ADDRESS button as shown below and then click the APPLY CHANGES button at the bottom of the page. Please note that for international orders, the billing and delivery address must be the same.